From a gene in DNA to a protein involves the splicing out of introns. An intron is the intervening, non-coding sequence of nucleic acid that is between the expressed sequences (exons) in a gene. It is removed from the primary RNA transcript by splicing and is a common feature of eucaryotic genes. Introns are the spacer regions of DNA that separate the information-coding parts of a gene. Generally introns are found in the DNA of more advanced species. Scientists believe that the only living creatures on earth billions of years ago were bacteria which belonged to a group called prokaryotes. But about two billion years ago, a group branched off from prokaryotes called eukaryotes which evolved into organisms including animals, plants, fungi, and some protozoans with bigger and more complex genomes. If human chromosomes were unraveled the DNA helix would be about two long metres (more than six feet), and the sections of introns inside it have been referred to as "mostly chaotic" and an "indecipherable wilderness". Sometimes the DNA that codes for introns is classified as junk DNA but this is an oversimplification since these stretches can contain DNA sequences important for regulating gene expression. Or they can encode for functional RNA; these non-coding regions include transfer RNA (tRNA) or microRNA (miRNA) sequences. The presence of introns in a gene may also be important for facilitating the trafficking of the pre-mRNA out of the eucaryotic nucleus. The original role of introns is unclear but one hypothesis is that introns allow gene shuffling to occur, resulting in the creation of new exon combinations and novel proteins. I was actually thinking of 'exxon' with two x's like the oil company -- it was a joke -- I was making fun of Gilbert because I didn't think those were the best possible terms. They were too slangy and didn't best describe what was going on. Nevertheless, Dr. Gilbert wrote down the terms on a napkin, and both terms appeared in a 1978 commentary in the journal Nature. There is no single mechanism for splicing an intron from the primary RNA transcript. Introns are classified into four groups based on the mechanism of splicing. In general splicing can be either autocatalytic or be catalyzed by a large complex of proteins know as the spliceosome. Splicing can also be viewed as a form of gene regulation since alternative splicing can result in different combinations of exons in the mature RNA transcript. In this way one gene can code for distinct open reading frames and hence has the potential to code for more than one protein. When a gene is activated, it is first transcribed [to pre-mRNA]. The introns are clipped out and the exons spliced together, and the whole thing is then translated into the protein. Biologists used to think one gene produced one protein. Now it's clear that one gene can produce many different proteins. 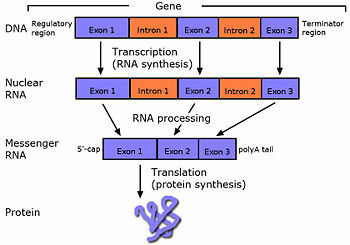 Under certain conditions, a cell clips out not only the intron fillers but also one or more of the exons. This is like taking a speech and removing many of the sentences. Done in different ways, it can produce many different messages. Scientists think that about five percent of the human genome has a "message" of one sort or another, with a particular order of nucleotide letters (A, G, C, T) being of utmost importance in determining important aspects of a human's body chemistry. Any addition, deletion, or change can have a big effect, including death. Still, there are vast stretches of DNA which was thought of as "junk DNA" but it is now clear that some has an important role. Conserved "non-coding elements" include insulators, micro-RNAs, exon-splicing enhancers and other molecules are "emerging from the shadows." They regulate the activity of protein encoding genes by turning them on and off, tweaking them, and coordinating the sequential action of their effects. How these processes operate are fascinating for scientists who study evolution, since "more of evolution's survival-of-the-fittest battles occurred in writing the instruction manual for running the genes than in designing the genes themselves". It was believed that the introns were functionless stretches whose only purpose was to break up stretches of exons, but this view has been questioned. Scientist Michael Lynch suspected the addition of introns into DNA was a harmful accident at first. When an intron was wedged into the middle of a gene, cells had to be able to recognize the boundaries and "skip over" the introns when making a protein. Lynch hypothesized that this first led to defective proteins, but that the overall effect of interspersed introns was a phenomenon called genetic drift which ultimately helped evolution, since it created new opportunities for adaptations to be successful. ↑ 5.0 5.1 5.2 5.3 5.4 David Brown. How Science Is Rewriting the Book on Genes, Washington Post, November 12, 2007. Retrieved on 2010-03-03. This page was last modified 18:32, 8 March 2010.